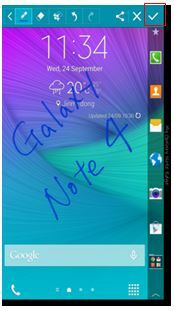 Galaxy Note EDGE: How to use the screen write feature of Air command with the S-Pen? Use this application to Capture, edit, and write memos on screenshots, then Share them. Follow steps below on how to use. 1. 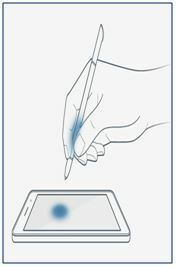 Hover the S-pen over the screen and press the S-pen button. 3. 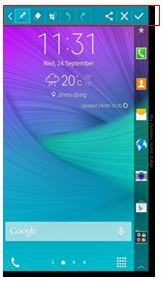 Toolbar is displayed in the captured screen. 4. 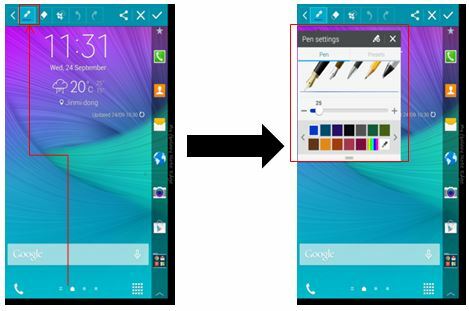 Tap on the pen icon if you wish to adjust the pen settings. 5. You can write or draw on top of your screen shot image. 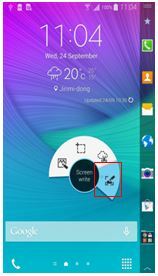 Tap on the check icon on the upper right of the screen to save the screenshot.